How do I even begin? This is just so gorgeous, but one must see it in person to appreciate it. 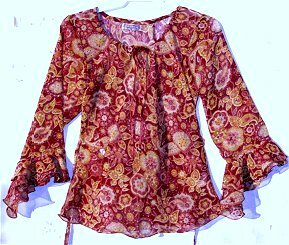 The flowing blouse is a somewhat dressier or more feminine version of the 1960's and 1970's style peasant blouse. This gorgeous blouse indicates it is made of a semi sheer rayon crepe, but it feels more like a polyester crepe, which it may be. Some of these shrinked when I hand washed them (the ones that felt like rayon) and some of them did not (the ones that felt like poly crepe). The coloring of this blouse is not quite as intense as it looks above since it is somewhat sheer and I fooled with the picture for quite a while so that you would get a better idea of the colors it contains. The background is burghundy which is covered with paislies and other shapes that are beige, cream, pale coral and a very pale sage. There is not gold or orange in it as the picture makes it appear. The coloring is more muted with the predominant color being burghundy contrasted by beige and a dark coral. The blend is very pretty and unique. The fabric is very thin, but one can get away with a beige bra on underneath. This lightweight vintage reproduction blouse has a drawstring tie at the neck that is adjustable. This blouse has a loose fit, but it has been cut on the bias so it can stretch outwards. In other words, the size is flexible. There is a tie on each side that can be tied loosely in the back or more tightly for a more fitted waist. Or one can cut them off for a more traditional 70s look. The sleeves are not full length by the way, but are longer than 3/4 length. The end of the ruffling just barely reaches one's wrist at the longest point of the ruffle. Size: 5-7 Chest size 32-34" optimal, but should fit up to a 37". (The cut makes the fit flexible) $24.50 USA S&H $4.65 VISA/MC Only Hand wash in cold.